Recently a friend started a blog and I started a book. For both of us, the idea of ‘putting ourselves out there’ is a scary one. “What if….” thoughts run through our minds: what if no one reads it, no one likes it, no one cares? As I have gotten further along with my book, quite a few people have asked me, “Who is your audience?” or “Who is your target market?”. And I haven’t had a crystal clear picture. I am sure there are a million reasons/blog posts out there that would tell me that finding my market should have been done before starting my book. But I didn’t do that. What I have come to realize is that the person who I am writing this for is me. I am choosing to respond to something I read that resonated LOUDLY with me. It inspired me. It moved me. It has, daily, motivated me to be a better teacher and a better student AND a better advocate for change in the way we deliver education to kids. Writing this book has clarified ideas. It is has made me articulate my thinking. I have questioned my position and I have asserted my opinions. I have thought creatively, collaboratively and independently. I have tapped into prior knowledge and I have built new understandings. I have gathered a ton of knowledge. A ton. What am I going to do with my knowledge? I am going to put it out there. I don’t know how this will look just yet but I think it will be great – no, awesome. And if it is not? My book is inspired by the work of Seth Godin – specifically his manifesto, Stop Stealing Dreams. I therefore did not find it at all surprising that this morning, I was delivered a special message from Seth to me (ok, he sent it to all his blog followers, but I would like to think he knew what I needed to hear). And what did I hear? That putting it out there is what matters. Shipping it. Committing. Seeing it through. Doing something with the information. Finishing it. As a teacher, I wondered how this applied to the work I ask kids to do? We are in the middle of our Exhibition and it is a big deal. I have enjoyed sharing my journey with them so they can see that it really is true that it doesn’t end once you leave school. That you might always be a little scared of putting yourself out there but the worst that can happen is that no one else applauds. Feedback from our kids today was that hearing my journey, really helped to clarify how they are going to shape and share their own journey – fantastic! I know there is more to this though. I have a whole lot of other information swimming around inside my head about effort and grading and rubrics and grading and how that links to putting it out there. I know there is a connection, I just need to smooth it out a bit in my mind. Ultimately, I want to focus on how I can support my kids in also choosing to put themselves out there. What do you do? How do you encourage them to take that leap? Or do you? 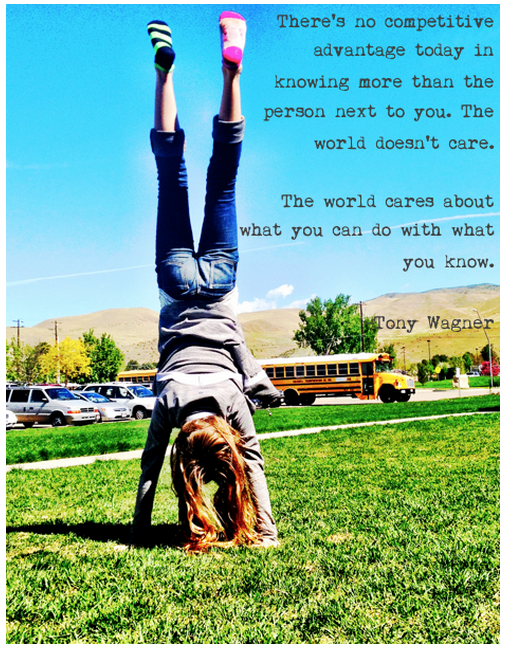 Thank you for the Tony Wagner quote and your perspective on it. I am amazed to read that people who consider themselves to be innovators are leaving Twitter because it has become too public. Information is everywhere and constant. In my mind the questions becomes does one stay in the main channel and paddling with the current or portage into the wilderness in hopes of finding great bodies of water in which to have a different experience with their unique perspective. Thanks for inspiring us everyday! I am also surprised to hear that people find Twitter “too public” – I am finding it invigorating and inspiring and it pushes me to contribute to this incredibly generous pool of ideas. Tony’s quote resonates loudly with me – why sit on your mountain of knowledge? What good are you doing? I like your analogy – for me, having tested the waters, I have been richly rewarded for my efforts in terms of how much I have learned. I feel like I am still splashing by the shore sometimes but I am enjoying the reward of tapping into the expertise and experience of others who may not necessarily be fifth grade teachers or elementary teachers, but who share a passion for and value the same ideals as myself. With that in mind, I look forward to pushing myself out in the wilderness more and more often!